CBIC Recruitment 2019: Central Board of Indirect Taxes and Customs invites offline application from qualified candidates. 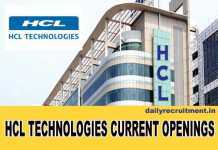 Currently it has many numbers of vacancies at Chennai, Mumbai, Bangalore & Kolkata. Recently CBIC has released the recruitment advertisement for Superintendent, Inspector, Administrative Officer, Executive Assistant & Tax Assistant Posts. Aspirants who want to get central government jobs in Tamilnadu, Karnataka can use this chance. CBIC application form and notification is available in official website. Interested applicants should send the filled application form to given address within 90 days from date of publication of this advertisement. CBEC will recruit the aspirants on the basis of deputation. Aspirants must hold analogous posts on regular basis. Aspirants should have maximum 56 years. CBIC will select the candidates on the basis of interview. After that selected applicants will be posted at Chennai, Mumbai, Bangalore & Kolkata. Applications received after the due date or incomplete applications will be rejected. More details of CBIC recruitment, upcoming central excise vacancies, merit list, selection list, CBEC latest jobs and etc. will be uploaded on official website. Last Date for Submission of application Within 90 days from date of publication of this advertisement. Go to official website cbic.gov.in. Applicants who have fulfilled the above eligibility, those candidates can apply to this job easily. Do not miss the wonderful career opportunity in CBIC. Aspirants kindly watch this page regularly for upcoming changes in CBIC job 2019. For more accurate information about this CBIC job notification, check their official website.